If you read my previous post on the interesting article about coccolithophore species-specific growth responses to environmental change, you may have been left wanting to know more about coccolithophores in general. I don’t blame you. Coccolithophores are pretty awesome. Taxonomically, coccolithophores are part of the phylum Haptophyta, which is primarily includes single-celled organisms across terrestrial, fresh water, and marine biomes. The marine haptophytes, such as coccolithophores, are important in the carbon cycle because they act as a “sink” for CO2; they are additionally important in the sulphur cycle because they produce Dimethylsulfoniopropionate (DMSP), which is then transformed into compounds that can lead to the formation of clouds. A coccolithophore bloom seen from space. 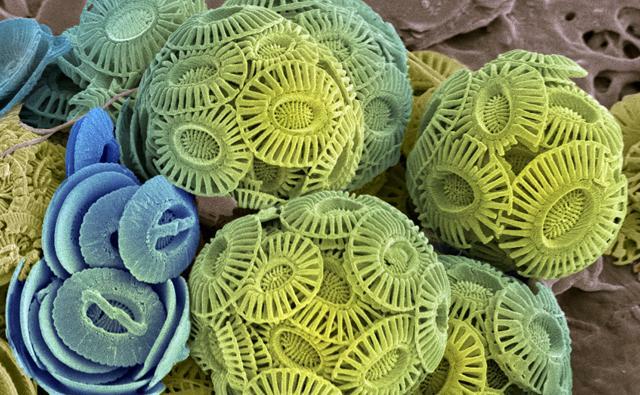 As mentioned in my previous post, coccolithophores produce calcium carbonate scales known as coccoliths. As well as securing coccolithophores’ place in the fossil record, coccoliths provide coccolithophores with increased surface area, which reduces how fast they sink. Coccoliths also make coccolithophores less palatable to grazers, although, along with other phytoplankton, they do form the basis of marine food webs. Coccoliths may also act as ‘coccolithophore sunscreen’, protecting coccolithophores from the damaging effects of the sun; they are so reflective that, when present in large numbers, we can see them from space! At only around 200 total species, coccolithophores are less diverse than diatoms and dinoflagellates, but the diversity of size and shapes within coccolithophores is immense. There are large variations in cell size, coccolith size, number of coccoliths per cell, and coccolith morphology as seen in the images below. Individual coccoliths are often shed over the life of a single coccolithophore, and following death; some estimates suggest that more than 1.4 billion kilograms of calcite is ‘dumped’ into the ocean by coccolithophores each year. Coccolithophores are most abundant in subpolar regions and prefer to inhabit the well lit, upper water column. They need access to sunlight because they are photosynthetic, meaning they make their own “food” using CO2, H2O, and sunlight. 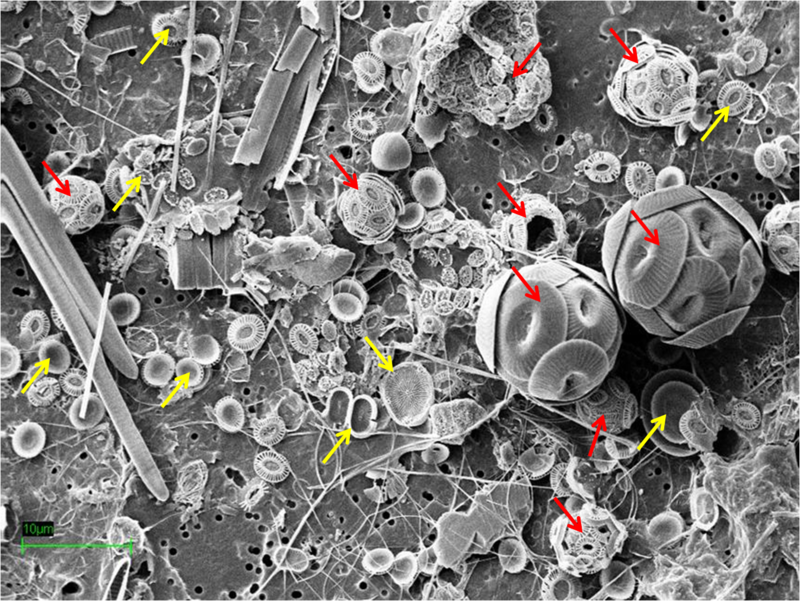 Diversity of coccolithophore size and shape (red arrows point to coccolithophores; yellow arrows point to individual coccoliths). Image courtesy of Alex Poulton. I am particularly interested in coccolithophores because of a recent paper published in the journal Science. The authors described the host of a diazotrophic (nitrogen fixing) single-celled cyanobacteria as a close relative of a calcifying taxa, indicating it is probably a coccolithophore. I have written previously about the importance of diazotrophy and the different types of diazotrophs. 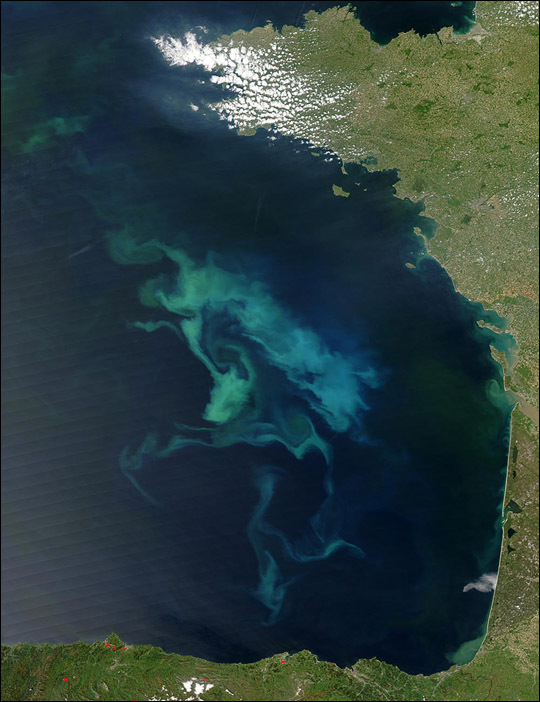 If the host of this cyanobacteria is a coccolithophore, that means it has a higher potential to contribute to carbon and nitrogen fluxes from the upper ocean to the ocean’s interior. We already know about how important coccolithophores are in the global carbon cycle, but this symbiosis would also link them to the marine nitrogen cycle, which is what my PhD focuses on. I’m looking for a list of coccolithophore species which shed their shells regularly. Specifically, I’m interseted in how often this occurs in these species, their size, and growth rates. Would you happen to know of any papers or resources with this information? I could start just with a list of species which regularly shed their coccoliths.